Hello Readers, you have landed to this guide which clearly explains about how customizing your Blogger blog with the custom settings, which are provided in the below guide, can make your blog Search Engine Friendly or Search Engine Optimized. This SEO guide for Blogger is aimed for those websites/blogs hosted on the Blogger platform and for the newbie bloggers. Blogger is directly linked with your Google Account. Blogging services like Adwords, Adsense, Webmaster Tools, Google Analytics can be easily integrated with Blogger and can be accessed with your Google Account. Blogger requires less technical knowledge - User needs to know only basic html coding and need not know much about designing. Auto Social Sharing - Once you publish a post on Blogger, it is automatically shared on Google+ page/account the Google Account associated with it. Mobile Friendly - The Internet accessed from mobile devices increasing daily and Blogger has various mobile templates which are also Search Engine Optimized. The below guide is proceeded with an assumption that the user has created a blogger website and it is active. It may or may not have published posts. 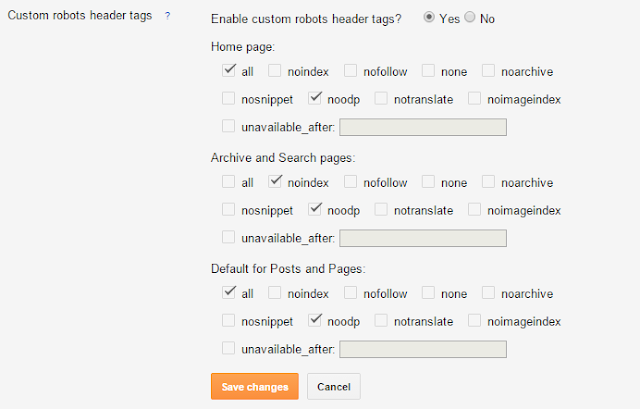 When you create your Blogger blog with a "blogname.blogspot.com" your blog has default settings and you can easily tweak it to make your blogger blog more search engine optimized if you try to activate or set the below mentioned settings. Thereby, you can make your blog to stand out from other normal blogs and will be more search engine optimized. By default, search description is disabled on blogger. But it is one of the most important parameter in Google SERP (Search Engine Result Page) as often noted as meta description. Once you enable this on blogger, you will be able to add meta description aka search description to the blog post when creating and it will be displayed in the Google SERP and it is also a main factor in increasing the Click Through Rate (CTR) of your link. For newbie bloggers, it is suggested that you have the same description for your blog on the basic settings also as mentioned in the meta description. 404 is the web page which is shown to the user when he/she tries to view a post which was deleted or else the address of the blog/website is provided wrong, then 404 page is shown. 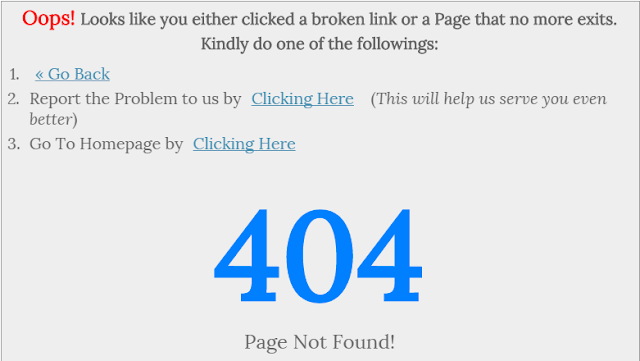 In simple words, 404 page is shown when an user tries to visit a broken/incorrect link or URL. and then click "Save Changes". Now if you want to check for custom 404 page, after your blog url, add some irrelevant words, like http://iamsomesh.blogspot.com/abcde and you could see your own custom 404 Error page. Do you know how Google, Bing, Yahoo and other search engines crawl your website? It is done through the robots.txt which tells the search engine about what articles does your blog has and what has to be indexed. In order to be on safer side and to eliminate duplicate data, that is, your blog may contain labels which point to a same post. If more post are found like this, then your blog may be penalised. In order to optimize your blog for search engines, Enable Robots.txt for your blog (Blogger >> Settings >> Search preference >> Crawlers and Indexing) and paste the following snippet of code into the Robots.txt box and just replace http://iamsomesh.blogspot.com with your blog address. It is similar to that of Robots.txt and just enable it (it is next to custom robots.txt) and put the tick marks as shown below. Many people just create a blog for the sake that they have some interest on it and as soon as they create, the first thing to make the blog look attractive is through the template of the blog. Whatever the blogger template you choose, check yourself the below mentioned points before uploading it to your blogger blog. Responsive Design - The theme must blend for all the devices through which your blog is being visited. It must support desktop, mobiles and tablets display according to the screen size. Widgets - Try to use minimum number of required widgets as more number of widgets on blogger blog may result in increasing your page loading time and affect your SEO. By using a responsive template, you can increase your revenue by 35% to 40%. You can show responsive Google Ads on your responsive blog. By implementing a responsive template, you can increase the CPC (Cost Per Click) of the blog. You must be very clear that you are the author of the blog and you must take the responsibilities of what things appear on your blog. And you must also tell the visitors of your website, what their responsibility is and which you cannot be responsible for. Thus by adding this page you are one step safer from problems which occur knowingly or unknowingly. Many of the users of internet want their data not to be shared with anyone and by adding this page to your blog or website, you make sure that the user's privacy is not violated and also tell them about what kind of data will be got from the visitors. This page is essential for all websites or blogs as it makes the trust for your website or blog. This page is all about what your blog about (it may even be an individual's profile if the blog is about a person). Make sure that you provide genuine info on this page as some fraction of visitors convert into customers when they know the story about the website/blog. So it is the page which is very unique about your blog. So make sure that it is able to turn your visitors into customers. It is also an essential page for a blog or website as the visitors or customers can easily contact the admin for any inquiry or suggestion for improvement of content or even report an error on your blog or website. Note that you get your customers from the contact page who ask you to help them. That's it. You are finished with the On page Optimization for Google Search Engine Result Page. On my next guide, I will give you more information on doing Off page SEO for Google and other Search Engines to rank higher in them. Comment below if you have any doubts on the above guide.